Platinum Tools invites technicians to actually use its products during CEDIA Expo 2018, including its ezEX crimping tool with a pass-through design. Ask any golfer if someone else should buy his or her golf clubs for them and the answer will always be a resounding “No.” You need to handle the club yourself… get the feel of it. The same can be said for hand tools for technicians. If a technician doesn’t like the feel of a tool, it is not going to breed confidence. Platinum Tools wants to avoid that discomfort for technicians by letting attendees at CEDIA Expo 2018 touch and literally use all the tools in its booth (#4352). “Our booth is a chaotic controlled mess,” quips Todd Cota, vice president of sales at Platinum Tools. 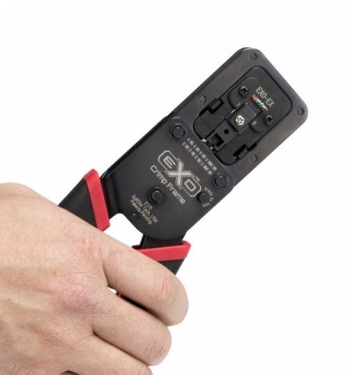 For example, the company’s ezEX crimp tool and connector is designed to work with larger cables with a pass-through design. The connector is POE compatible, which helps streamline the installation process because the wires actually go through the front end of the connector so you can verify the wire sequence before you crimp the connector, says Cota. Also, with the amount of wiring integrators are installing, cable management can be a big problem. Platinum Tools’ HPH J-Hooks are designed to secure large cable bundles properly. The hooks replace more cumbersome wire-based cable management devices. Platinum Tools will also have its tools in use in the ADI Security Solutions area (booth #6140) on the CEDIA Expo 2018 exhibit floor.